As key players in the mowing world Bosch have stayed true to their word of covering all bases by getting involved in the most high-tech end of the market with this robotic mower. Like others of its ilk, this mower is an expensive, but what you lose in up front cost you’ll reap in time that you’d otherwise spend mowing, not to mention of course that it’s quite a novel addition to your garden. 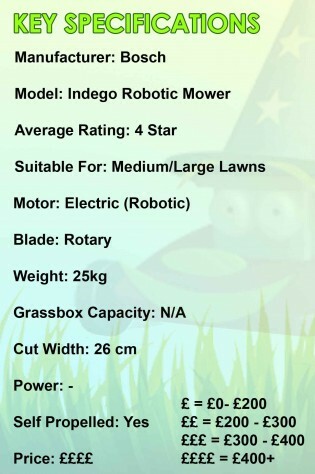 Suitable for areas of up to 1000 square metres, this mower is completely uninhibited by the magnitude of the task ahead of it, and what’s more it does it regularly, meaning the small cuttings it produces don’t need to be collected, they just biodegrade on the spot and go back into the lawn’s own natural ecosystem. Unlike some robotic mowers the Indego features ‘Logicut’ technology to help ensure that no two areas of the lawn are mowed more than any other. 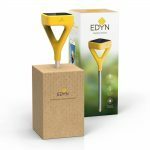 This is quicker than a random pattern of mowing which will continue to trim the same areas over and over again which can be bad for the health of the lawn. 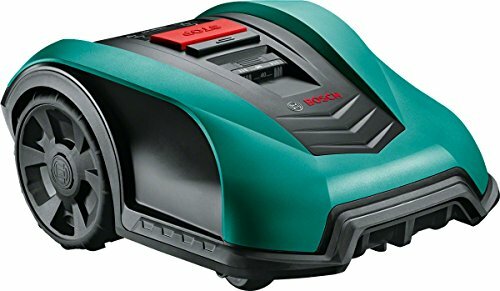 If you have a large garden and you like it to be regularly maintained, but can’t justify paying someone else to do it, then it could be well worth considering the Bosch Indego. Though the price tag seems excessive at first glance, it will pay for itself in the time that you’ll save over its many years of service. Nice review! I do think this is a great mower but you could argue it’s a little over priced. Although if you get a good looking lawn out of it then I’ll shut up!